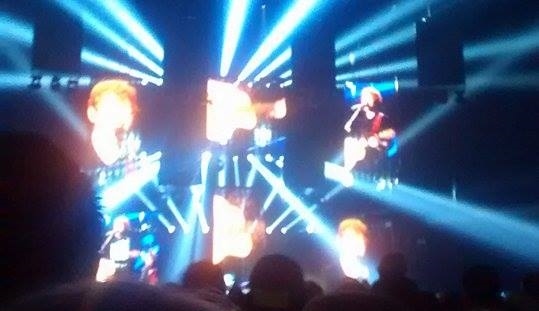 On the 27th October I went to see Ed Sheeran, one of my favourite artists, at the Phones 4u Arena in Manchester. You would think Ed Sheeran’s soulful and heartfelt music would be more suited to a smaller, more intimate venue but he managed to pack out the huge arena in impressive style. Sheeran had the monumental task of putting on a show using just his voice and guitar. There were no impressive costume changes or backing dancers; things which seem compulsory for big names like Lady Gaga and Robbie Williams. Instead, Sheeran was a one-man band with his incredible musical talent and charisma. It makes such a nice change to hear a song live that completely matches the quality of the recorded version. Sheeran has an angelic but powerful voice that can enchant a crowd of thousands without the help of a backing track or additional singers. The only special effect used was a huge board behind Sheeran which projected animations and graphics that reflected the themes of each song. This was used to particularly good effect during ‘I See Fire’ with scenes from The Hobbit eclipsing the stage. This made the song even more thrilling and imitated the experience of watching a 3D film at the cinema. ‘The A Team’ was also a highlight; it was a delight to see Sheeran perform the song which catapulted him into stardom. The upbeat hit ‘Sing’ closed the show perfectly and the way Sheeran used his guitar as a drum machine was elating and brought the concert to an end in epic style. His charisma and modesty make him an extremely likeable stage presence and his affable charm made it easy for him to silence a crowd of thousands. It’s amazing that just a couple of years ago Ed Sheeran was an unknown name, performing in small venues across the country while attempting to make a living. It’s actually quite depressing to think that Ed Sheeran is only 4 years older than myself, but it’s refreshing to see an artist who has succeeded in the industry due to his talent rather than his contacts or appearance. ‘My goal is for you to leave this gig with no voice’ said Sheeran when he walked onto the stage. He certainly achieved that.